Pupils in Years 5 and 6 receive one term training each during the school term. 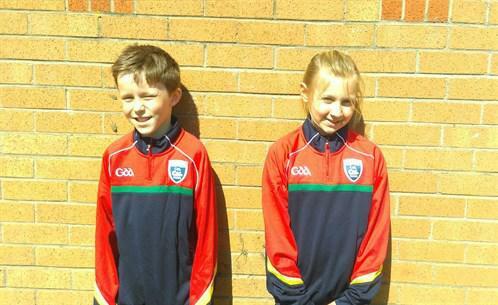 "Today, St Mary's entered a Gaelic Football Tournament. We split equally into mixed ability teams and started to play matches. I was part of the St Mary's 1. This is my report on St Mary's 1 Gaelic Matches. Our first match, out of five, was against St Hughs 1. They were a very tough team who played very well. Therefore, we lost 9-7 but still had our hope for the second match. After the second match, against St Hughs 2, we had lost 12-5. They were a very good team who probally practiced alot. Then it came to our third match and luckily, we drawn 6-6 to St John's. Also, they were in my opinion one of the best schools that entered the competition." "Today was the Lancashire Schools Gaelic Football Tournament. St Mary's entered two teams: St Mary's 2 and St Mary's ". So let me tell you about the day St Mary's 2 had. Our first match out of five matches, we were against St Hughs 2. The score line was 12-9 to us. After this we played St Hughs 1 and we lost by 1 point 15-16. I thought that this team was more challenging than the last team. Our third match was against St John's and we were very happy about this win because the score was 27-3. We found this team easy eventhough they had won 2 years in a row. Our fith and final match was against St Kentigerns, the score was 12-10 with us in the lead. Thanks to Mr Jackson for being our coach for the day,We had a great time!" BIG well done to Charlie & Elizabeth on achieving players of the tournament Award, well deserved from their performances throughout the competition.